1 Although it is not recommended, I almost always take the butter out of the refrigerator to reach room temperature before proceeding with the recipe. However, it is important to understand that many recipes have a seasonal element to them. In the hot weather, the butter needs to be out of the refrigerator only fifteen minutes or so to have the right consistency. 2 In a good sized mixing bowl, put the two cups of flour. Add the sugar and salt. Mix these ingredients together well. I use a whisk to do this. 3 Measure the orange juice into the measuring cup a leave close by. Also have a board on which to roll the dough and a pie plate close by. Also your rolling pin and a good-sized spatula close by. 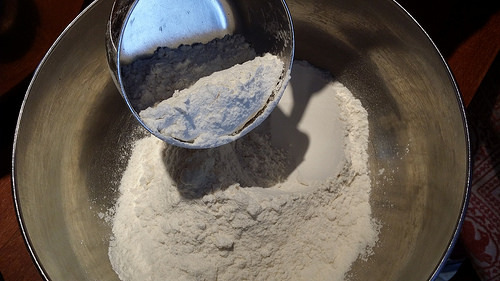 Also about half a cup of flour ready for sprinkling and keeping the pie dough free of both the surface on which you are rolling and the rolling pin. 4 Cut the butter onto the top of the flour mixture in approximately one inch chunks. 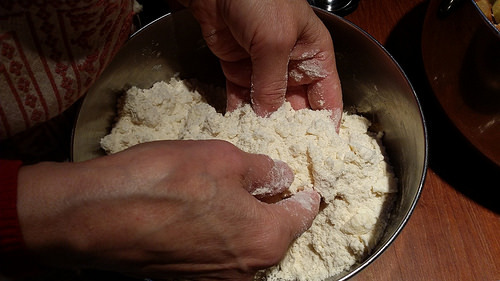 Either with your fingers or a pastry blender, gently combine the flour mixture and butter. 5 When it looks something like cornmeal, though not quite that fine, sprinkle the orange juice over the mixture. It's fine if there are some little pieces of butter or little clumps of the butter and flour mixture. This actually contributes to a good crust texture. With a spoon (I find a wooden spoon works well), gently combine the juice and dry mixture until it begins to hold together; if needed add a bit more orange juice (try to use just enough juice to hold the clumps together; too much liquid tends to toughen the end product). At this point, if the right consistency, you should be able to make two balls with the mixture, something like the way you make a snow ball, gathering the pieces together and compressing each portion in your two hands until the "ball" holds together pretty well. 6 Now, on the floured board, flatten each portion into a disk about five or so inches across. 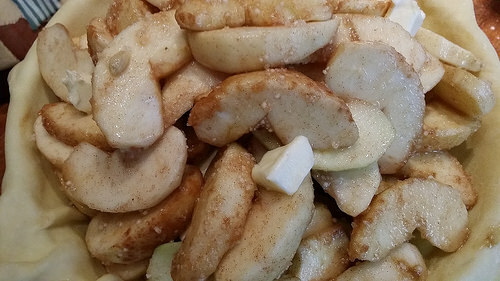 Wrap these in plastic wrap and refrigerate while you proceed to do the pie filling, or even for a few days. This refigeration somehow develops the gluten in the flour making the rolling out process easier. When you are ready to roll out the dough, it is a good idea to take it out of the refigerator for a while. I find about room temperature works best. 7 When you are "ready to roll," place one dough disk on the floured rolling surface. While you don't want to use too much flour, I believe in using enough so that the rolling process is manageable. Have that spatula near by! 8 Keep the rolling pin well-floured. With deliberate strokes, starting from the middle of the disk, and rolling out to the edge, proceed to roll in each direction about two times. Then, use the spatula to lift the dough from the rolling surface. Gently pick up the dough, add some flour to the surface, and turn the dough over to the other side. Make sure the rolling pin has enough flour on it, and proceed to continue rolling the dough. After about five rolls or so, once again use the spatula to lift the dough. Starting at one side, roll the dough over the rolling pin, and add more flour to the rolling surface,and also to the rolling pin. 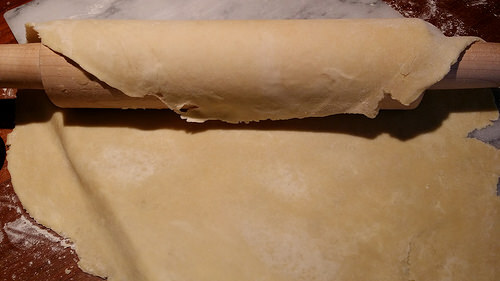 Replace the dough on the rolling surface. Once again continue rolling out the dough, just until you think it will fit into the pie plate with some overhang (a diameter of about 14 inches). I usually eyeball this and that usually works, although, when it isn't just right, I do my best to do some patching here and there, and this doesn't seem to detract from anyone's enjoyment of the finished product. 9 Again, gently use the spatula to separate the dough from the rolling surface. Then, again, gently, and starting from one edge, roll the dough over the rolling pin, and carefully move it over to the pie plate. Gently unroll the dough from one side to the other, very close the the top of the pie plate, gently letting it settle into the plate. Use some liquid and flour to do any patching. 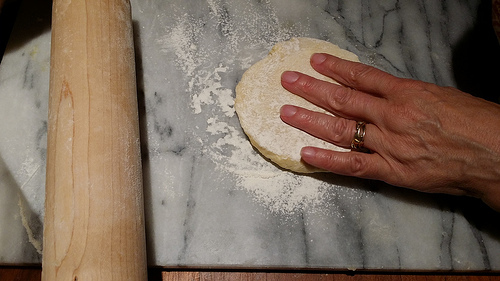 10 If you're doing a one crust pie, with your fingers, roll over the top edges of the overhang, pinch them together, and do your best to let the dough sit on top of the edge using your fingers to make a fluted design, or a free form design, or whatever you like. 11 Preheat the oven to 375 degrees. With a fork, prick the pie all over making sure to pierce the dough right through to the pie plate, to prevent air bubbles from forming underneath the crust. Bake for about 15 minutes, or until nicely browned. If it shrinks some, don't worry: the filling will do a lot for the end product. 12 If you're doing a filled double crust pie, after you have the bottom crust in place, if it's a fruit pie, sprinkle a little breadcrumbs over the bottom surface. This way the bottom crust bakes and becomes a little crispy rather than becoming soggy. 13 Add the filling. Repeat rolling out the top crust as above, realizing it may not need to be quite as big, depending on how full the pie plate is. 14 Add some chunks of butter to the fruit filling, if desired. Place the top crust on the filling. Roll the top crust over the bottom crust allowing again for some overhang. Gently pinch the bottom and top crust edges together. Flute the edge or let it be somewhat free-form, as you prefer, or according to your experience. 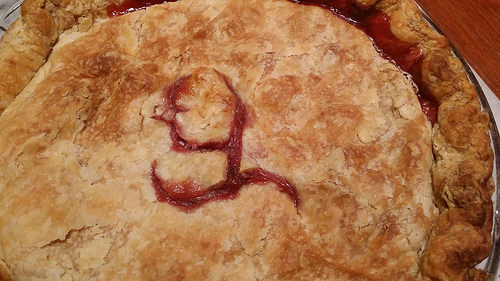 There is always room for progress in pie crust assembly as far as I'm concerned. 15 Bake the pie according to the particular recipe.